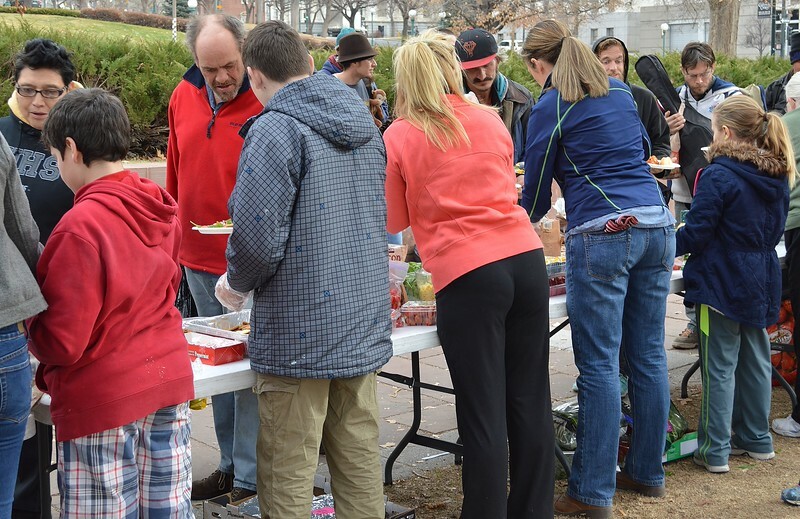 Images of a free meal event sponsored by Catholic Charites in Denver, Colorado. Includes shots of people standing in line for food and voluteers serving meals. 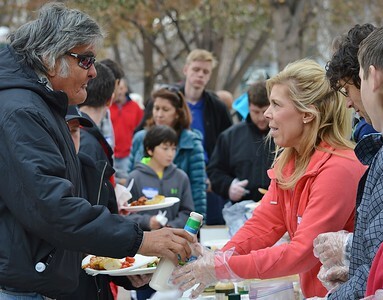 Woman serving food at free meal event handing bottle to Native American man holding plate of food. 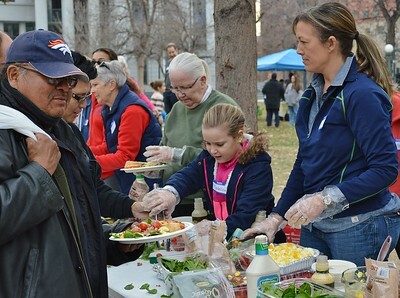 Man wearing Denver Broncos hat holding plate of food at free meal event. On other side of table, woman and young girl serving food to others in line. Line of men waiting for free meal, one holding bottle of water, some with grey beards. Man holding water bottle whils waiting in line for free meal, another man behind him. 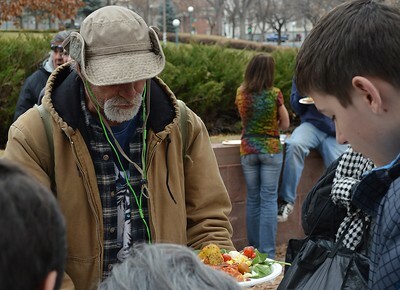 Young man serves food to an older man at free meal event. 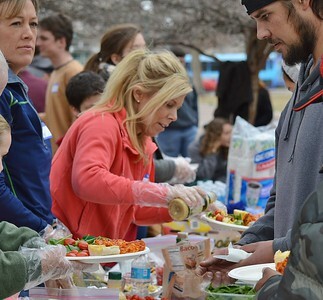 Others serving and receiving food in the background. 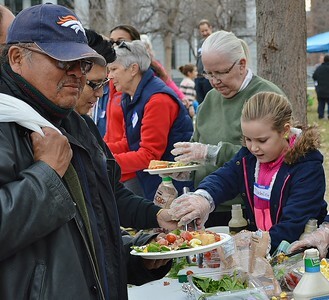 Man wearing Denver Broncos hat holding plate of food at free meal event. On other side of table, young girl and senior woman serving food to others in line. 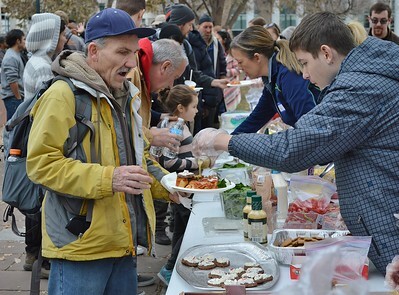 Man smiles while holding plate of food, while in line at free food event. Other men in line for food in the background. Man with grey beard looks down at plate of food being served to him by young boy. 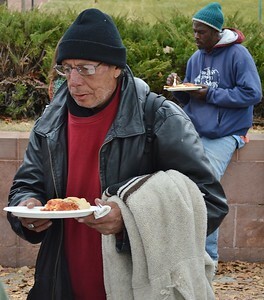 Older man carries palte of food at meal gie-away, inbackground, African-American man sitting on wall eating. 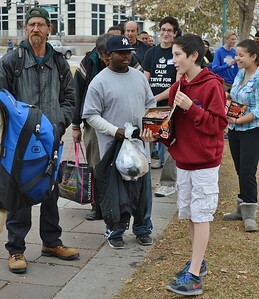 Young boy handing out hand warmers to people in line at free meal give-away. 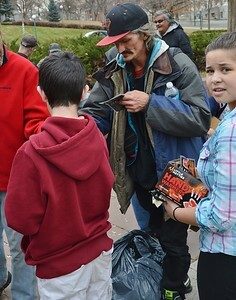 Young girl looking back at camera as she hands out hand warmers at free meal event. In background man reaches for hand warmers being handed out by youn boy. 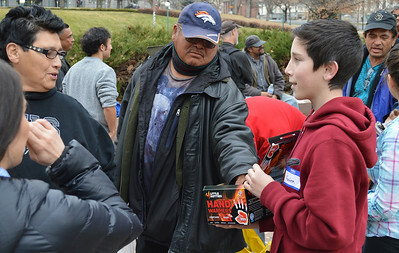 Man wearing Denver Broncos hat reaches for hand warmers being handed out by young boy conversing with woman. 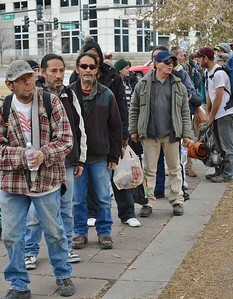 Line of people serving food at free meal event, seen from behind. People receiving food on other side of table facing the camera. Woman pouring from bottle onto plate of food at free meal event, young man in line reaches for plate of food being handed to him. 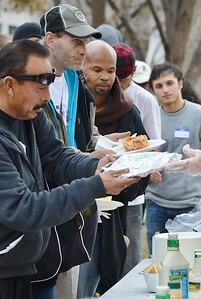 Two men, one hispanic, holding plates of food at free meal event, in background, African-American man in line, behind him, volunteer wearng name tag looks on. Hand extending plate on right side of frame. 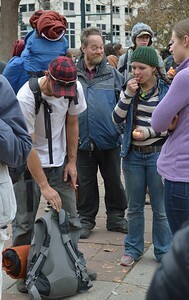 Man wearing large backpack, reaches down to another pack on the ground, behind him, others in line for free meal, including young woman eating piece of fruit and man with hands in pocket, smiling. 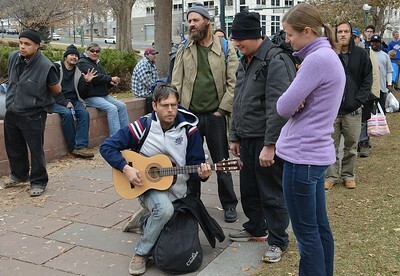 Man playing guitar as he stands in line at free meal event, behind him a long line of others waiting.